Welcome back to my step by step guide on Una the Skyhunter and I hope you enjoyed or found part 1 useful. This time i’m going to go through the rest of the main parts of the model through to completion – so the cloak and metals. The main bit on most Circle Orboros models, especially the Blackclads, is the cloak. I’ve unfortunately had to swap my paints over the years for this as i originally used GW’s Camo Green and Catachan Green but when they changed their paint range these paints disappeared. 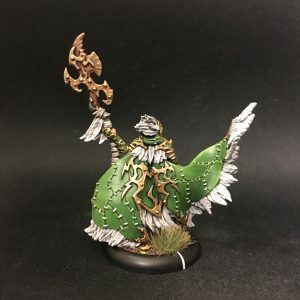 As a result i now use P3’s Gnarls Green and Wurm Green, the tones of which are slightly different to my old models but as paints go – they are pretty good paints. 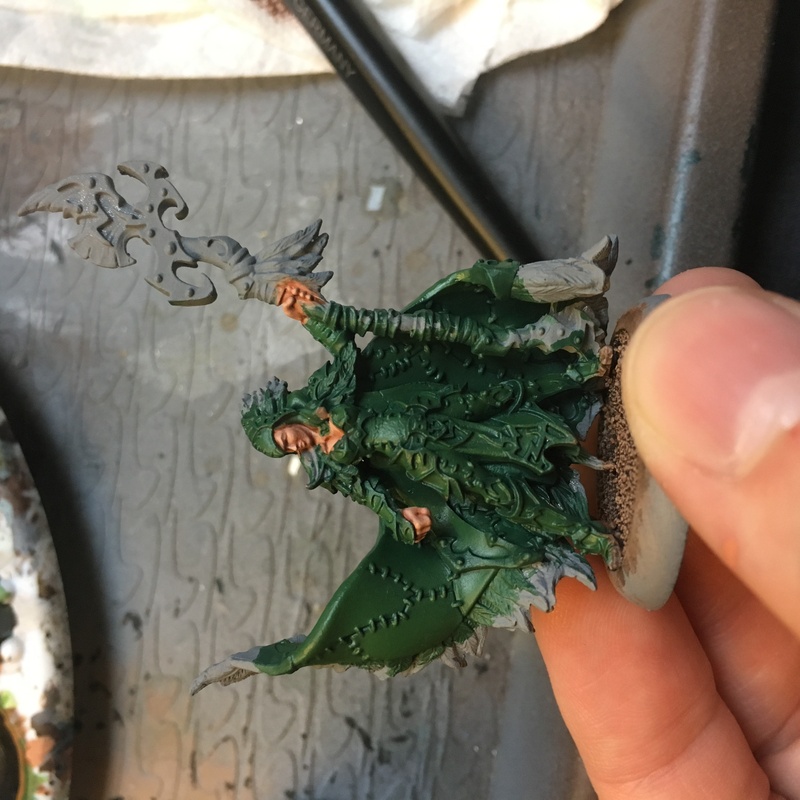 So the way i paint the cloak is by following my usual method – this helps me keep things consistent between models across the faction and importantly across time. So it all starts with a big base colour of Gnarls Green that i did way back at the start of my first article. To reiterate, i do this because i don’t want to have to paint around anything i would paint before the cloak in order to get a solid base layer. 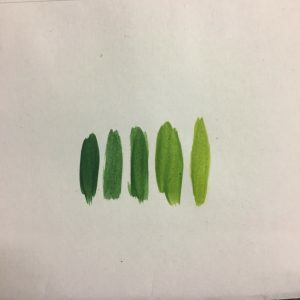 Mix a small amount of Wurm Green (from now on i’ll call it WG) into Gnarls Green (now GG) and then paint this on the raise areas of the cloak and other paints intended to be green. It’s less important to note at this stage which bits will end up brighter than the others – but be aware of what you intend later on in the layering process. Mix some more WG into GG – i think i did 4 layers of mixing but i didn’t keep track of quantities of mixing and to be honest i don’t pay much attention to it i just do it by feel. Let’s assume this layer is 50/50 as it is the second layer of 4. Similar to the flesh tone mix i do have a photo of the different colours below. Now we should start looking at where you want the highlights to go. The base layer of GG creates the darker shades of green that now should mostly be only in the recesses of the model. The previous step should be covering most of the raised areas of the cloak and giving you a good place to start with the next few steps. Note – Una’s cloak is a bit unusual in that is is broken into bits of cloth stitched together. This changes the way i painted it slightly, but the principle is the same. Imagine that the cloak was sculpted without the gaps in the different pieces of cloth and paint it as if it was 1 piece of material but making sure to not paint in those gaps and you should end up with a good highlight. Now you want to layer on this highlighted layer on all the raised areas of the clock and cloth again. As you can see from the photo, this means the rounded area of the cloak on the left of the model where it is blowing around in the wind, and also within the central body area where you can visibly see the model being raised by stitching etc. If you keep your paint thin then you can do a couple of layers of at this step and ‘strengthen’ the colour of the layer on areas where you want it to be lighter. I did a few layers on the left side of the cloak as this area would be quite bright and it’s the dramatic part of the model so demands some attention. More of the same but with more WG – as you can see it’s starting to get brighter and the cloth more defined. At this point – similar to the face – you may want to go back into the recesses with a green wash or a dark wash to add more contrast in areas you feel need it. I find it’s a good idea to do this at this step as the next set of highlights acts as a tidy up and will clean up areas where you’ve added a wash and make them a bit more refined. Now it’s the last of the WG and GG mix highlights – you can see that it has been applied more sparingly around the edges of the cloak near the feathers and at the top rim of the cloak on the left. Similar to the face, this will sharpen all the highlights up and give those extreme areas the brighter highlights they need. The very last step is a final highlight with pure WG. This is the bold final highlight that really brings it all together and for this I’ve painted around some edge of the cloak in the areas which need it. If you look at the left hand side of the cloak you can see it on the top and bottom but also on the edges of some of the patches where light would strike the edge. Similarly on the back of the model I’ve done the same – with this highlight and the GG still remaining in the edges the individual patches of the cloak are visible and the effect of this patchwork cloak will be finished by just simply painting the stitching near the end. Top Tip – things like the stitching here or the feathers on the head should ideally be painted last. 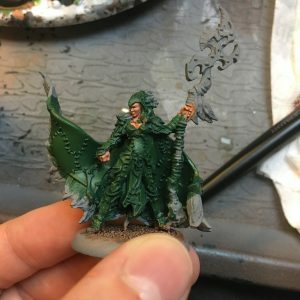 The stitching may have a tendency to rub off while you are painting depending on how you are holding the model and you don’t want to have to paint things twice if you don’t need to. Also, i was holding the model by the base and the feathers on the head so this was more for me as i don’t then rub the paint off that area either. That’s the cloak done! This is the biggest and most visible area on the model so you need to make sure the layers are thin so that they blend together (without doing any actual blending which becomes an easier technique to understand and attempt once you start using thin layers of paint more often like this). You don’t want the layers you are painting on large areas like this to be visible unless you are going for some cell shading type effects which can look quite nice if you do them right. As you can see i have skipped some steps here on the way to the metals, i’ve briefly explained their process below as these are only minor areas on the model. Importantly though they had to go before i painted the metals because some of the areas are ‘underneath’ the metal areas (like the wooden areas at the top of the staff) and would be hard to reach if i had painted them after the metals. Additionally i like to paint the metals last on a model if i can because i don’t want to have to change my water and go back to painting non-metallic areas. The water you wash your brush will have small metallic flecks in it after painting the metals and can ruin the non-metallic colours you use if you continue to paint with it. Feathers – I didn’t do a step by step on these because i’m not entirely happy with the way i do feathers at the moment. Also they aren’t something that will be on every model so it seemed like a waste of time to go through this. Though if you are interested, they are the same colours as my Scarsfell Griffons. 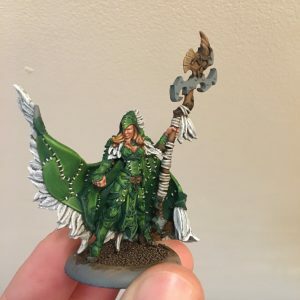 I did something similar with my Una1 model where her feathers were the same colour as the Rotterhorns, back when the Rotterhorn was the go-to Griffon. Brown – There wasn’t much i’d decided would be wood or brown leather on this model and so i just went ahead and painted it. The step by step process is literally the same as the steps before this but i went with P3 Battlefield Brown to P3 Bloodtracker Brown (with either a brown wash or black wash depending on what i was painting. The final tone of the brown ends up being different depending on which wash you use here) then a final highlight of P3 Bloodtracker Brown mixed with Vallejos Yellow Ochre. Bandage/light brown cloth – This was wrapped around the staff and i paint these the same way with P3 Trollblood Highlight, GW Agrax Earthshade wash, Trollblood highlight, add some white, add some more white. Metals as you might have guessed follow a similar pattern to what I’ve painted up until now. The difference here is that i try to get a bit more contrast in the final highlights because if you can it will make them look more ‘shiny’ as the edges would catch and reflect light. I only own the Vallejo Game Colour Polished Gold and i want my golds to be a bit more burnished so i add some brown into them to begin with. This way they aren’t so gleaming and hopefully tonally they fit with the rest of my palette. I do a base colour with the Polished Gold plus some P3 Battlefield brown. It doesn’t take much brown to change the colour of the gold so be careful with it and add it in a bit at a time. I do several thin coats here as Gold doesn’t cover very well and you don’t want to put it on too thick which can happen with the metallic paints. Be careful to keep an eye on the consistency of the paint itself because in my experience it tends to ‘dry up’ a lot faster and so you may need to keep thinning it as you paint. Once a solid base colour has been applied i do an all over wash with Agrax Earthshade to give it some depth before continuing. Now go back over it with the same gold and brown mixture from the base coat using the same principles as in steps 1-3. Now instead of going to straight Polished Gold i actually add in Army Painter Shining Silver (a Mithril Silver equivalent) to the mix and go straight into highlighting the edges or any raised areas. I’m looking for parts of the metal that will catch the light. Here is where you start to see what i mean about contrast, rather than building up in stages i have skipped a step here and hopefully it makes the metals look shiny. The final step is either straight Shining Silver or mostly Shining Silver with some of the previous gold and brown mix into it. The aim here is to get the really edge bits of the metals and make them pop a bit. You want to get that contrast between the edge of the metal and the rest of it, use this sparingly as you don’t want it to be everywhere because if it’s used too much then it’ll lose its impact. Tip: You can use lots of different colours on the washes for the metals to give different effects. For example you may want to use some blues on silvers to give it a cool tone. You can also use purples on the golds and even reds and whether or not you use these is up to what you want to achieve. You could also simply use a sepia wash as well as a glaze at the end to tie it all together and make it more yellow. It’s worth experimenting with metallic paints and washes as you can do a lot with them in tandem. With a few tufts and some leaves to fit the basing scheme for the rest of my army that is Una the Skyhunter complete! At this step its easy just to finish the base without having the worry about getting any on the model you have just painted (like i said in part 1, its a messy area so i do it first), all you need to do is glue the tufts in and paint the edge of the base. Easy. Like i said at the very start, it’s not to the standard that some people can do, but it’s not bad and it’s something that’s fairly achievable with practice. 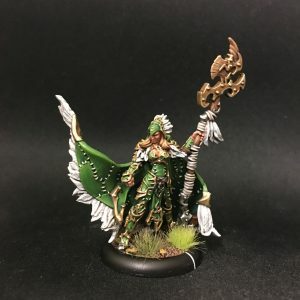 I hope some of you have found this useful in some way, if you have any specific requests let me know and next time i paint something similar i can write an article about it. Jacobs armies are stunning, can’t wait to see what he does with grymkin. That’s another great article, thanks Jacob!